single match is your winter’s kindling. Your fuel is delivered only as required . . . there is no need for storage, no “keeping an eye” on the fuel supply. And your heating plant, because of its one-purpose design, assures you maximum heating value from the fuel consumed. 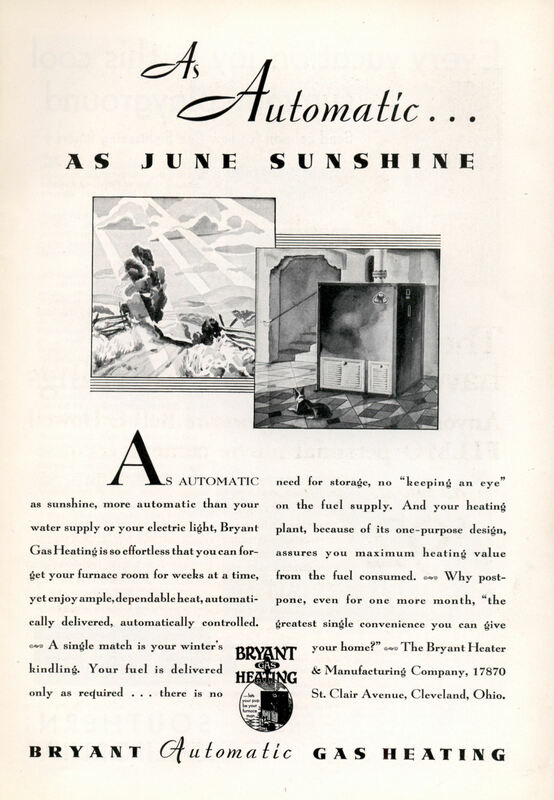 Why postpone, even for one more month, “the greatest single convenience you can give your home?” The Bryant Heater & Manufacturing Company, 17870 St. Clair Avenue, Cleveland, Ohio. In the 1930’s when coal was king this thing must have been amazing! There’s a wonderful memory of a coal furnace in “A Christmas Story” that’s fairly accurate other than the curse words used.